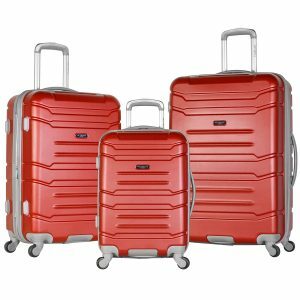 Olympia Denmark is a three-piece hard side spinner luggage set of 21”, 25 and 29” suitcases with a modern look and feel, solid and durable construction and user-friendly features at a budget price. You can buy it in seven different beautiful colors of white, wine, navy, black, purple, green and teal. You’re better off choosing the non-black colors if you want to find your suitcases easily at the airport. But you’ll also be OK with the black and navy colors due to the set’s distinctive design with grey handles, zippers, and wheels with bottom corner guards and bottom handle. There are some price differences between these colors, so you may want to pay attention to that once you’re choosing the right one for you at Amazon.com product page. Each Olympia Denmark bag has four 360-degree rotating spinner wheels and will move freely in a zero-weight movement in all directions, no matter how heavy or lightweight it is. You can hold and move your bag next to you, rather than pulling it behind you. You shall be holding the very good quality aluminum telescoping handle that locks at three points. There is also a grip handle at the bottom to let you lift the bag easily in a lot more balanced way. Each of these three suitcases is expandable by an extra twenty percent by unzipping the zipper in the middle to get some additional space for packing. You’ll find the beautifully imprinted fully padded lining inside. You’ll also see the buckle tie-belt along with a removable clear vinyl 3-1-1 wet zip pouch on one side and a mesh zip pocket, shoe pockets and an extra zip pocket inside. All your belongings will be kept safe and well protected throughout your journey. There is a globally patented hidden section in the expandable part of the cabin size bag and you can even put your laptop in there. So that you can have very easy access to your personal belongings like your passport and ID or anything you may need during your journey, without needing to open the whole bag in the airport in front of everyone. The suitcases in the set are made of solid ABS material that makes them resistant to impact and durable. Both the largest 29-inch (10.4 pounds and 29 x 19 x 11.5 inches) and the medium size 25-inch (9.1 pounds and 25 x 16 x 10 inches) suitcases will need to be checked in at the airport prior to your flight and you can take the smallest 21” carry-on (8 pounds and 21 x 14 x 9 inches) to the plane and put it in the overhead bin above you. Please note that these measurements include the wheels. They nest into each other and that is how they are shipped and can be stored in your closet when not in use. There are no locks provided on the bags of this set. 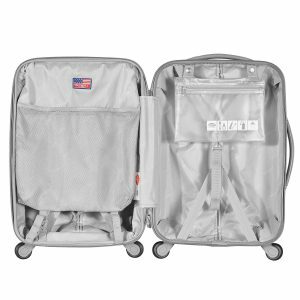 We like the beautiful modern design and different pretty colors, a great organization inside the bags, user-friendliness overall, easy maneuverability, spaciousness, sturdy construction yet lightweight and the reasonable price tag. Olympia bags are offered with a warranty of ten years, but you may want to double check with the seller on Amazon.com. You’ll be very happy with these bags at the current price level if you don’t have super high expectations of a premium and expensive luggage set.